Today, with a morning full of meetings and a grumbling tummy by 1130, we decided to try out Polpo's for a Venetian lunch. With the most delicious food I have out in a long time I was not disappointed. The rustic restaurant both inside and out could have been plucked from a small unassuming Venetian back street and placed just behind a bustling regent street. Once through the small, cheese cloth covered door you enter into a small Italian wonderland. Cured meats hang in-between the draped lights along the bar and bread is piled high in baskets at the end. The lighting is low, and the off cream walls with a loving wear and tear touch really make you feel at home. 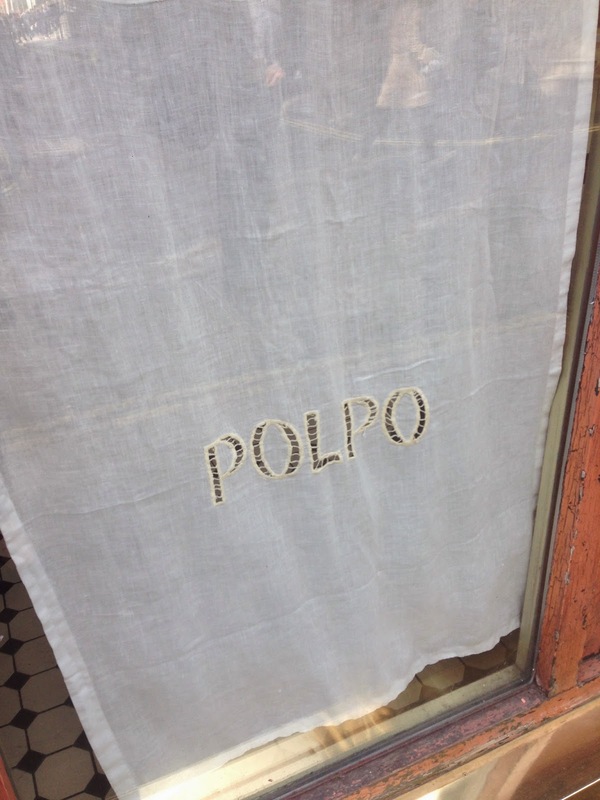 Polpo is one of several restaurants and once used to be home to the Venetian painter Canaletto, an amazing coincidence. It is described as a Venetian Baraco meaning a small humble restaurant serving good simple food. The style of the menu are small dishes that can be shared (a kind of tapas style) and spilt between a couple or more and really leave you feeling truly satisfied by the end. 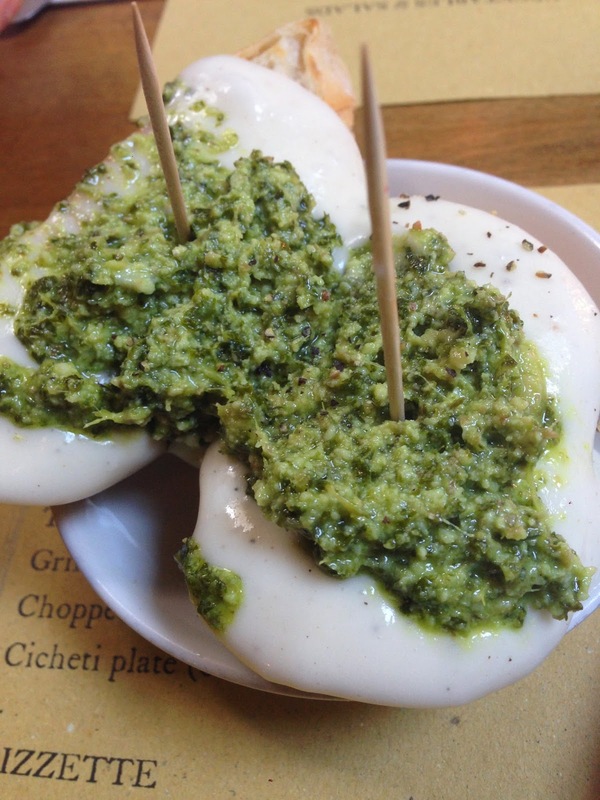 We kicked off with Taleggio pesto crostini, crusty bread dripping in melted cheese and topped with fresh pesto. and potato and parmesan crocchette. followed by Loch Duart salmon tartare, Horseradish & carra di musica. Deliciously fresh salmon paired with the strong horseradish worked extremely well. Next came the Rabbit Ragu with black olives & fresh gnocchi. Rich and full of flavour. with the ragu came a Pizzette, we went for a simple ham and gooey italian cheese with spicy jalpeno peppers. We finished with chocolate salami, small but perfect and all that was needed as a lunchtime treat. Nutty, fruity and chocolaty, it brought the meal to a simple but very tasty end. A gem hidden in the most unassuming place, really worth a visit, bring your taste buds and grumbling bellies and you will be relaxed and satisfied by the end of your italian culinary journey, this place cannot be missed!